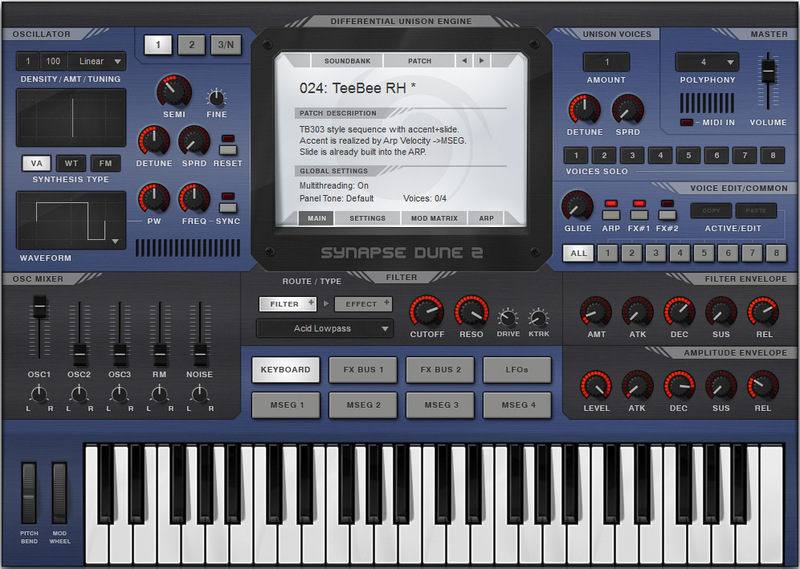 Dune 2 is a virtual synth from Synapse Audio Software. Dune, or Differential Unison Engine, is a technology that explores the unison feature of synthesizers to create exquisite and amazing sounds. Dune 2 is equipped with three oscillators, three synthesis types, filter and amplitude envelopes, two effects busses, three LFOs, a mixer section, arpeggiator, modulation matrix, four envelope generators and much more. It’s a powerful plugin and very fun to operate. The upper left shows the oscillators section. It’s possible to combine three synthesis types to create a patch: VA/subtractive, Wavetable and FM. There are three oscillators available. Oscillators 1 and 2 are, in fact, stacks of up to 32 oscillators, where it’s possible to set detune, spread, tuning, frequency, pulse width, and sync parameters. Below the oscillators there’s the oscillator mixer section. Five sliders control the volume of the sounds sources: oscillators 1, 2 and 3, ring modulator and noise. The center screen gives access to the synth settings, such as velocity, pitch bend, modulation rate, as well as the modulation matrix and the arpeggiator. Soundbanks and patches can also be loaded and saved in this section. At the top right, there’s the master section, where it’s possible to set the overall volume and polyphony. In the Unison Voices section, the user can set the number of simultaneous voices of a patch (1 to 8). Each voice will have then independent oscillator settings, resulting in rich and amazing sounds. The Voice Edit section comes with a glide knob and on/off switches for arpeggiator, FX1 and FX2 sections. So, it’s possible to set whether a given voice will be affected by effects from FX1, FX2 or both. The Filter section has typical controls for cutoff and resonance, drive and keytrack knobs, as well as 19 filter types and 14 filter effects. Eight gray pads will give access to FX1 and FX2 settings, LFOs, keyboard display, and also to the four envelope generator (MSEG 1 to 4). Those are incredible features of Dune 2: you can draw an envelope and use it to modulate any parameter. Dune 2 has also Filter and Amplitude envelopes, with ADSR controls. The modulation matrix will make it possible to create infinite combinations of all Dune’s parameters. So, this is an amazing synth, with lots and lots of sound possibilities. – Windows and Mac OS compatible. You can download a trial version of Dune 2 on Synapse website: http://www.synapse-audio.com.